Hi there! 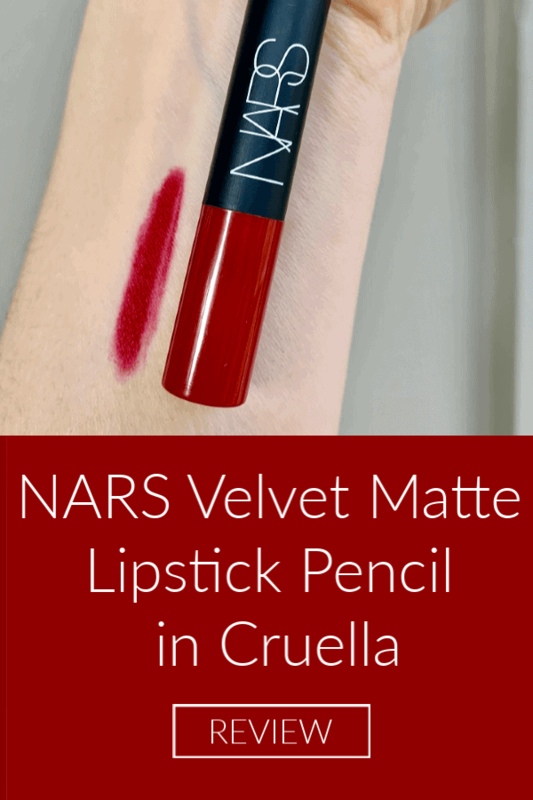 Today I want to review the NARS Velvet Matte Lipstick Pencil in the color Cruella for you all. 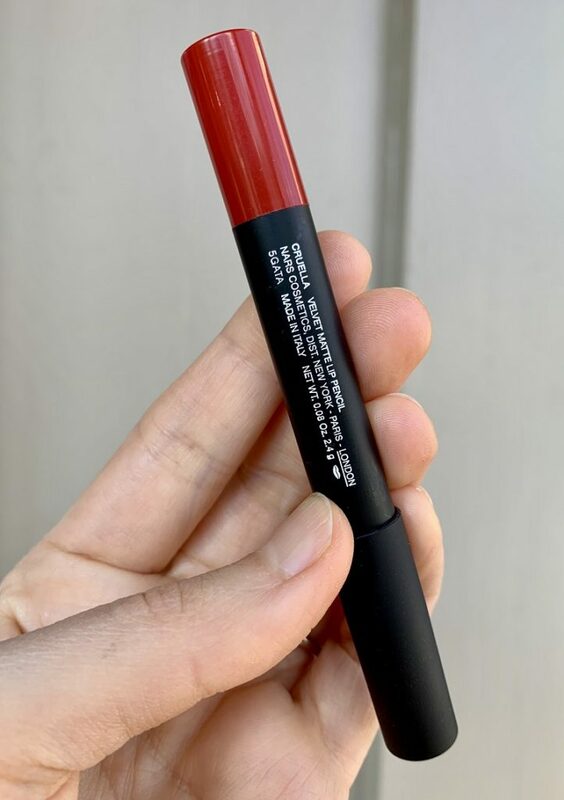 As I’ve outlined in my review about Loreal Paris Colour Riche Shine Lipstick, I am a beauty junkie who loves trying a bajillion different lipstick types, colors, and textures. I am always trying to track down the mythical “unicorn” of lipsticks. One that will last a long time, keep its pigmentation, and not smear all over my face. 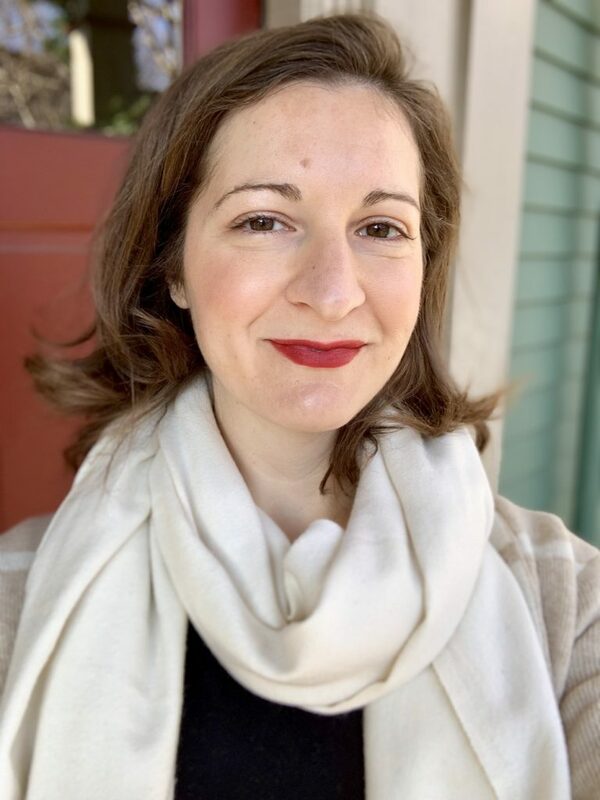 I’ve owned the NARS Velvet Matte Lipstick Pencil in the color “Cruella” ($27) for a year now, and am just getting around to writing about it – sorry! I did not receive this lipstick for free. I bought it myself and am sharing my honest thoughts about it in case you are also thinking of picking up this lip color or brand. So let’s dive in to some of my thoughts about this lip pencil. NARS Velvet Matte Lipstick Pencil in Cruella is a rich red color great for a variety of skin tones (I am fair with olive undertones). When I use the pencil, it doesn’t feel like a skinny traditional lip liner in your hand. It is a little thicker than a lip liner, but not as fat as a chunky lip gloss or even as wide as a regular tube of lipstick. You can sharpen the Lipstick Pencil with a wide sharpener to get a really fine point, if that is helpful in application. When I apply the lipstick, I start by lining my lips with the Cruella pencil, and make sure everything is even. If I make a mistake, I can just firmly wipe it away before it really starts to set on my lips. Then, I fill in the rest of the lips. That’s it! It is really easy to apply and work with if you make a mistake. As I mentioned above, NARS Velvet Matte Lipstick Pencil in Cruella is a rich red color. I find that it looks the same online as in the tube. And the same on my lips, too. It sets in a matte finish, but with buildable color in case you want to really amp up the intensity. It’s also quite blendable if you want to shade in a second color. 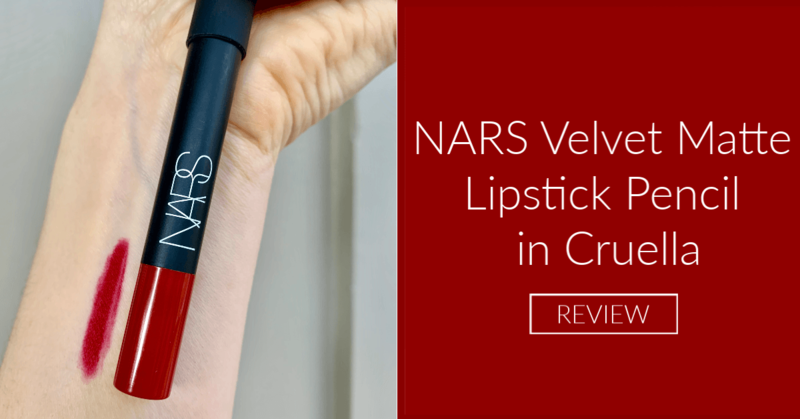 Review of NARS Velvet Matte Lipstick Pencil in Cruella. Photo credit Stephanie Janes. I do not touch up my photos except for a bit of brightness. This shot was taken outside and is not retouched. Is NARS Velvet Matte Lipstick Pencil in Cruella Long Lasting? In short, yes, it is long lasting. But it’s not as long lasting as a liquid lipstick. I drink tons and tons of water and coffee throughout the day (we all have our thing, ok?! ), and the NARS Velvet Matte Lipstick Pencil in Cruella stays on pretty well. It does help if I gently blot my lips after applying to remove excess color and to allow it to dry down to matte before eating or drinking. But if you eat a meal, especially if it is greasy or requires biting into something like a sandwich or apple, it’s going to rub off relatively quickly. It’s not an 8-hour+ color lipstick, but it’s also not marketed as such. So just pack it in your bag because you’re going to need to touch it up. Is NARS Velvet Matte Lipstick Pencil in Cruella Drying? No, it is not! I was pretty surprised that a matte lip color did not dry out my lips at all. Its formulation has Vitamin E and emollients to help preserve a creamy texture while wearing it. The NARS Velvet Matte Lipstick Pencil in Cruella comes in a thick black lip pencil with a removable black plastic top. I’ve never experienced any problems with the lid falling off or the product marking up my purse. It is easy to sharpen, and the packaging looks very high quality and chic, overall. In conclusion, the NARS Velvet Matte Lipstick Pencil in Cruella is one of my favorite lip products! I do wish it was a tad more long-lasting, but I like the bright color payoff and its ease of application. I’d love to pick up another in a more neutral or pink color soon. 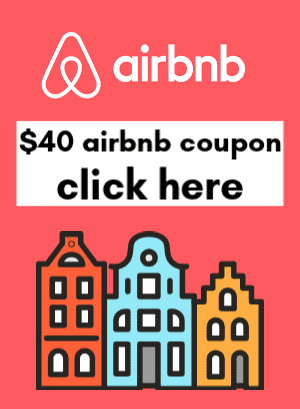 Please comment below if this review helped you!